Online books retailer Amazon.com erased untold numbers of books with mature or queer themes from its site, apparently in a drive to remove "adult" material. And some science-fiction authors were hit hard. 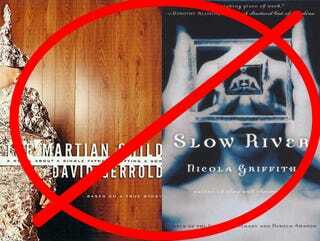 But many of the books that were de-ranked, such as David Gerrold's The Martian Child and Nicola Griffith's Ammonite, had no adult themes whatsoever. Non-fiction science books such as Biological Exuberance, a study of homosexuality among animals, were also de-ranked. By the end of the weekend, after a storm of internet protest, Amazon apparently changed its story and told Associated Press the de-rankings were the result of a "glitch" that was being fixed. (This explanation was greeted with some skepticism online, as the appearance of a Twitter hashtag called "glitchmyass" showed.) When the L.A. Times asked why this "glitch" only affected books with certain types of content, an Amazon.com rep declined to comment. As a result of stripping the sales rankings from these books, they also disappeared from some searches on Amazon. (It seems as though these books still turn up if you search under "books," but not under the default search, "all departments.") Also, the books disappeared from any bestseller lists. The move did not seem to affect the Kindle editions of any of those books, just the print ones. Whether the move was a glitch or a deliberate policy that blew up in Amazon's metaphorical face, it affected a decent number of science fiction and science books. Authors like Nicola Griffith and Katherine V. Forrest saw all their science fiction books disappearing from Amazon search results. Also removed were science books like Biological Exuberance: Animal Homosexuality And Biological Diversity. Curiously, David Gerrold's orgiastic The Man Who Folded Himself was unaffected, but his chaste book The Martian Child was erased. Similarly, Samuel R. Delany's Dhalgren seemed unaffected, but most editions of The Einstein Intersection were. It's silly. They've removed The Martian Child from their page rankings which was based on an award-winning novelette about how I adopted my son and was the source for a warm-hearted movie starring John Cusack. Meanwhile, they've left The Man Who Folded Himself ranked, which is a far more explicit novel about a man who explores a number of unique sexual possibilities. Obviously, they didn't think this through. Amazon says it's a glitch. Let's hope they fix it soon. Amazon's policy is idiocy of the highest order. Some thoughtless manager OK'd the low-hanging-fruit approach. ("Hey, if you want to protect Moral Americans from na-s-s-s-ty sexual content, then deleting all queer books from the rankings—and therefore the bestseller and some search listings—will get lots of 'em at once! Woo hoo, straight Christians will be safe!") That manager should be fired. And then I want a public apology from Jeff Bezos. This is important. A quick and quiet revocation of the policy is not enough. I want a public acknowledgement and a pledge to never again try to shove queers under the carpet. It's the only way to counter the perception queer readers and queer writers don't count. Being invisible is dangerous. It ruins careers and it puts young readers at risk. Writing is my only source of income. No listing = no sales. Taken to its logical extreme, this policy could mean I starve—that I starve because I'm queer. It also means putting some editors in a terrible position. What if I write a story in which women kiss, send it to an editor, and he feels he must refuse it because its inclusion in his anthology might get the book labelled LGBT and so kill sales for everyone else in the book? Countless readers (okay, dozens) have told me that my fiction has helped them through tough times. Two readers have told me that one of my novels literally saved their life. Imagine—again, I'm taking this thought to its logical extreme—if these readers hadn't found my books; they'd be dead. I'm being extreme because the people I'm trying to reach are either not exactly thinky types or their corporate communication is screwed. As my partner, Kelley Eskridge (a current Nebula nominee and a management training specialist, see Humans at Work) said so succinctly, "they're an online business getting massacred by an online uprising, and they're not responding online... Someone needs to get behind the wheel over there." Slow River won a Nebula. Ammonite won a Tiptree. Bending the Landscape: Fantasy won a World Fantasy Award. Will SFWA and the Tiptree Motherboard and the World Fantasy Convention meekly take this shunning of their own? I doubt it. But, oof, think of the time these organisations are going to have to spend dealing with this. An online retailer thinking in 20th century terms. Laughable as well as dangerous.